It’s hard to avoid the buzz these days about the Internet of Things (IoT), the next evolution of computing where the connections are made, not just between PCs and servers or across mobile devices but to billions of devices across the Internet. As IoT gains traction, connections are being made among wearable devices, thermostats, cars, medical devices and myriad other things in order to communicate, share data and take action. As IoT proliferates, the demands on enterprise, service provider and home networks grow exponentially, placing additional demands on network architects and administrators to build and maintain networks that operate effectively and efficiently. A key component of that is the wider adoption of Ethernet connectivity, which has been migrating to 10 gigabits per second (Gbps), 40 Gbps and, eventually, 100 Gbps capacity. Trusted Ethernet represents the underlying networking layer on which IoT devices and the operating systems and software applications that power them run. IoT growth predictions can be stunning. Research firm IDC predicts the number of connected things on the planet to reach 212 billion by the end of 2020. According to the Cisco Global Cloud Index, annual global data center IP traffic will reach 7.7 zettabytes by the end of 2017. A zettabyte is one byte times 10 to the 21st power. That’s a huge amount data to be in motion across Ethernet networks and at rest in storage devices. IoT connections are being made not just on wired networks, but also on fast-growing wireless networks using Wi-Fi and Bluetooth technology. Much of the IoT buzz is driven by fascinating new things that are being developed by multiple companies. 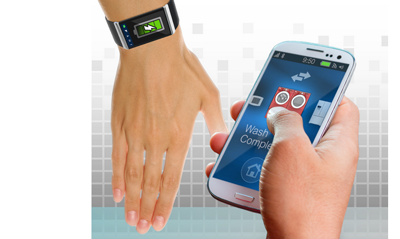 In addition to a range of non-conventional Internet-connected devices such as smart appliances, IoT includes a growing number of intelligent wearable products such as fitness trackers that provide real-time data on the user’s vital signs and activity levels. In industrial settings, an IoT device embedded in a jet engine can send statistics on how the engine is running to system controllers. Software-Defined Networking (SDN). SDN delivers a network-wide software platform to deliver better coordination, control and programmability in order to reduce the complexity of these modern networks. Ethernet switches are ideally suited for SDN as they provide the fabric of the Internet and data centers. Network Function Virtualization (NFV). Complementing SDN, NFV moves networking functions from dedicated appliances – such as routers and switches -- to general purpose servers that run virtualization technology in order to make Ethernet networks more scalable, agile and efficient. Cloud Computing. The cloud delivers the additional computing capacity required to satisfy growing demand to an enterprise or small business from a third party. With the cloud, organizations can crank up capacity to meet growing user demand without having to invest in new IT infrastructure. In addition, the ability to host processing and data in the cloud provides a mechanism to relocate that capacity to geographic locations where the data is being created as well as control the devices that are generating the data. Cloud Computing also depends on a well-designed Ethernet network, since low latency and high bandwidth are required to actualize the value. Big Data. As more things seek to connect to the Internet and each other, the volume of data traversing networks increases, but the larger those data haystacks grow, the harder it is to find the all-important needles within them. Big Data analyzes vast databases of information to glean the most relevant insights from which end users will most benefit. Ethernet, with its high capacity and low latency capabilities, is again ideal for interconnecting the servers that crunch this data. Green Data Center. As data centers grow in size and complexity, energy costs can skyrocket and efficiency can suffer. The New York Times reported in 2012 that data centers may waste as much as 90 percent of the electricity they obtain from their local electric utility. Migrating to more energy-efficient and higher capacity Ethernet connectivity does much to green-up the data center. One study shows that if networks migrated to 10G Energy Efficient Ethernet, from 1G devices, CO2 emissions could be reduced by up to 3.5 million metric tons, which is the equivalent of taking 2.3 million cars off the road or eliminating consumption of 1.3 billion gallons of gasoline or 27 million barrels of oil. Network automation tools such as SDN, NFV and others, combined with Ethernet connectivity at 10Gbs and faster speeds, will together deliver a networking foundation onto which the software layer for IoT devices will run. That physical network will be complemented by wireless connectivity with processors built into Wi-Fi and Bluetooth-based devices to extend network connections. Together, they will allow end users to get the most out of the billions of connected things expected in the future. Cloud Dataflow, a fully managed service for creating data pipelines that ingest, transform and analyze data in both batch and streaming modes. Cloud Dataflow is a successor to MapReduce, and is based on Google's internal technologies like Flume and MillWheel. Google Cloud Save, the latest release enables Android applications to synchronize data between devices with push notifications with no server code required. Cloud Debugger, a new tool that provides a full stack trace and snapshots of all local variables for any watchpoints set in code with no performance impact. Cloud Trace, a tool that provides deep insights into the performance of cloud applications. It helps visualize and understand the time spent by an application for request processing. A developer can compare performance between various releases of an application, see latency distributions and correlate application changes to performance changes. 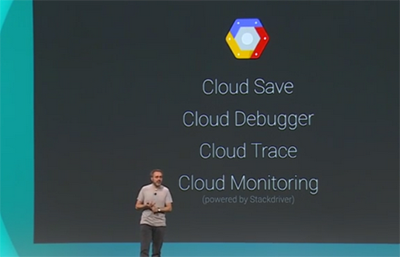 Google Cloud Monitoring powered by Stackdriver, designed to identify and address unusual behavior across your application stack. Cloud Monitoring is aware of popular open source applications and will automatically generate dashboards and alerting tuned for them. Cloud Platform integration into Android Studio, simplifies the process of adding a Google App Engine backend to a mobile app. Android Studio now has three built-in App Engine backend module templates including Java Servlet, Java Endpoints, and an App Engine backend with Google Cloud Messaging. Swisscom has selected PLUMgrid's OpenStack Networking Suite as a foundational element of its cloud-based IT infrastructure. PLUMgrid features a highly distributed, software-based network virtualization platform designed for cloud operators and large-scale cloud environments. The company said its technology enables Swisscom to leverage existing physical infrastructure to build a secure multi-tenant virtual network with PLUMgrid’s Virtual Domains and reduce the provisioning time from weeks to seconds. Swisscom is Switzerland’s leading telecommunications provider and ranks as one of the leading Swiss providers specializing in the integration and operation of complex IT systems, with 6.4 million mobile customers, more than one million Swisscom TV customers and roughly 2 million retail broadband connections. The carrier has decided to use OpenStack as its core component for cloud virtualization orchestration. 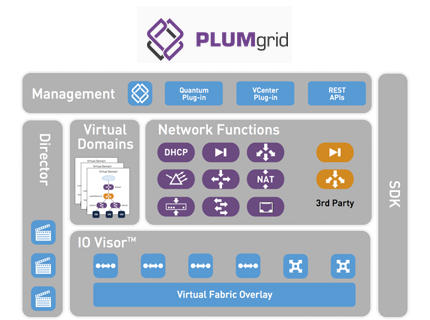 PLUMgrid, a start-up based in Sunnyvale, California, offer its PLUMgrid Platform, an infrastructure virtualization solution that enables the creation of on-demand programmable networks, which the company calls Virtual Domains. The goal its to allow administrators to create, copy and deploy secure multi-tenant virtual networks in seconds. 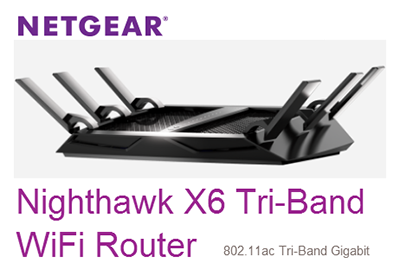 NETGEAR introduced its new Nighthawk X6 AC3200 Tri-Band WiFi Router (R8000)-- the first tri-band WiFi router based on the new Broadcom 5G WiFi XStream platform. The WiFi router uses six high-performance antennas and three network bands, one 2.4GHz and two 5GHz, to deliver a combined WiFi speed of up to 3.2 Gbps (1300+1300+600 Mbps) -- the fastest to date. It balances the network load to ensure the best WiFi performance for each device and deliver the maximum wireless range. The Nighthawk X6 is powered by a 1GHz dual core processor with three additional offload processors. It supports NETGEAR Beamforming, a smart, signal-focusing technology that improves WiFi connections by locking onto a wireless device on the network and pinpointing WiFi signals directly at the device. Broadcom noted that the average household is expected to own roughly 50 Internet-connected devices by 2022, up from approximately 10 today. Its 5G WiFi XStream Platform features five core "Penta Core" central processing unit (CPU) to maximize network capacity. SmartConnect software is used to ensure each Wi-Fi device operates on best frequency band. The platform automatically separates coexisting 802.11n and 802.11ac Wi-Fi devices into distinct frequencies. Another shot in the online storage wars -- Google announced Drive for Work, a new premium offering for businesses that includes unlimited storage, individual file sizes up to 5TB, advanced audit reporting and new security controls for $10/user/month. Google Drive for Work offers 24x7 phone support and a 99.9% uptime guarantee. It include all of Google’s productivity apps like Docs, Sheets, Slides, Sites and Hangouts. Google is also adding enterprise-grade security and compliance, including a SSAE 16 / ISAE 3402 Type II, SOC 2-audit, ISO 27001 certification, adherence to the Safe Harbor Privacy Principles, and can support industry-specific requirements like HIPAA. Earlier this month, Microsoft announced 1 TB of OneDrive storage for all versions of Office 365, including the 5-person home version that costs $9.99 per month and the personal version costing $6.99 per month. Microsoft said the landscape for online services is quickly changing and that merely providing cloud storage is table stakes. 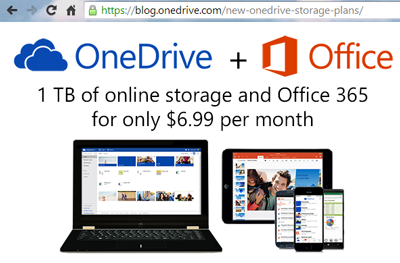 By providing 1 TB with Office 365, Microsoft effectively supersedes the storage-only providers. For those who only want online storage and not Office 365, OneDrive pricing has been cut 70% to $1.99 for 100GB and $3.99 for 200GB. 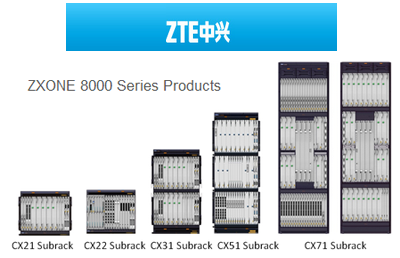 ZTE introduced a 400G OTN solution based on its ZXONE 8000 large-capacity cross-connect platform and ZXONE 9700 Packet OTN platform. The 400G OTN solution is aimed at metro/regional core infrastructure networks. It features multiple modulations including Nyquist QPSK, 16QAM and 8QAM. Additionally the 400G OTN solution supports software-defined optical networking using ZTE-designed low-power chip sets, and photonic components. “Faced with the challenges of rapid traffic growth, high bandwidth data centre applications and cloud computing, carriers have increasingly been considering building large capacity, evolving and ‘elastic’ networks. The ZTE 400G transmission equipment with multiple, adaptive modulations will be a must for all future networks,” said Mr. Wei Xiaoqiang, Director of ZTE BN products. Juniper Networks introduced a set of enhancements to its SRX Series Services Gateways to help large organizations manage a broad range of deployments and use cases while simplifying administrative overhead. The enhancements offer simplified and centralized management and an open services platform for essential security features, including intrusion prevention system (IPS), unified threat management (UTM) and application visibility. Junos Space Security Director's integrated logging and reporting and role-based access controls can now be used to manage next generation security services including user firewall, application security (AppSecure) and UTM. A single, central management platform delivers a simple method for managing all Juniper Networks firewalls, eliminating the complexity and time needed to support multiple management platforms. Juniper Networks SRX now integrates directly with Active Directory to apply user role-based firewall policies without requiring any additional devices or agents. AppID delivers granular management of application visibility and control on a per policy basis. It can be used to combine security for the data center and enterprise edge into a single box. The new AppID engine includes a heuristics engine optimized for identifying evasive or tunneled applications. This feature is important for blocking risky applications such as peer-to-peer applications or adding control over social, video and communications applications such as Skype or BitTorrent. AppID will also identify nearly twice as many unique applications as before. Alcatel-Lucent announced a EUR 3 million investment in Eblink, a company based near Paris, France that offers a wireless fronthaul solution for connecting base stations and small cells. EBlink's radio system support up to three sectors, or tri-band sectors and is CPRI compatible. It is currently available in the 5.8 GHz band, and the company expects to add additional licensed and unlicensed bands in the near future. ALU also signed a commercial and technological partnership agreement with EBlink. Alcatel-Lucent said EBlink’s wireless solutions complement its own wireless LTE and small cells offerings. 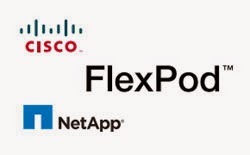 Cisco and NetApp passed the $3 billion milestone in sales for their FlexPod integrated infrastructure solution, which combines compute, networking and storage into a single unit. FlexPod unit shipments have grown 81 percent year-over-year, with demand for FlexPod solutions now reaching a $2 billion annualized demand run rate. FlexPod is deployed with more than 4,100 customers and available in over 100 countries, an increase from 2,300 customers, and 70 countries last year. The product was first shipped in 2010. Wind Telecom has selected ZTE to build the first 4G TD-LTE network in the Dominican Republic. The network will operate in 2.5 – 2.7 GHz spectrum and cover major cities and rural areas of the nation. ZTE said its unified platform EPC and eNodeB solutions, based on ZTE’s proprietary Cloud Radio technology, will help Wind Telecom achieve savings in capital expenditure, and operation and maintenance costs, and lay solid foundations for future growth. ZTE will also provide mobile devices that will appeal to users and help them take advantage of the broadband capabilities of the new network. ZTE has deployed commercial 4G TD-LTE networks for operators globally including China Mobile, China Mobile Hong Kong, Bharti Airtel and Hi3G in Sweden.